Walk 51 miles through the stunning Somerset countryside of the Quantock Hills, the Brendon Hills and Exmoor, a landscape that inspired Coleridge to produce some of his best known work. Or ride 34 miles from Nether Stowey to Exford. At Lynmouth the path links with the South West Coast Path National Trail. 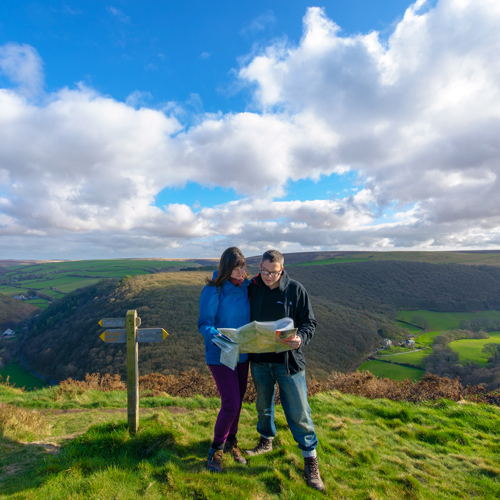 A delightful 30 mile circular walk can be made by walking from Porlock on the Coleridge Way to Lynmouth and returning along the coast path. You will travel through a variety of landscapes: heathland, moorland, deciduous & coniferous woodland, farmland, deeply wooded valleys and historic villages with expansive views over the coast towards Wales. Most villages along the route have at least one pub to provide you with welcome refreshment. There are also a number of delightful tea rooms and village shops to visit. The Coleridge Way can be completed over six consecutive days, making it ideal for an excellent walking holiday. The Route Guide will help you to plan the trip. Stay for a few days and enjoy the high quality bed and breakfast accommodation along the way, all offering a friendly welcome and some providing a luggage transfer service to make your break even more relaxing.